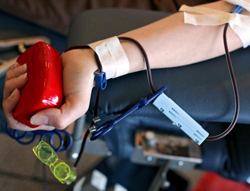 Blood will be shed on campus today — but don’t worry, it’s for a good cause. From 10 a.m. to 3 p.m. today, the Oklahoma Blood Institute will host a blood drive in the College Union, said Katie Treadwell, Service Learning and Student Life programs coordinator. Treadwell said the event, usually held twice a semester, is open to everyone. The first day of the blood drive was held yesterday. Before giving blood, potential donors must fill out a questionnaire as well as complete a physical exam, said Karen Fabian, OBI representative. For more information, contact Student Life at 405-682-7523, or visit the OBI website at www.obi.org.